Shnoop has got this Totes Isotoner Light N' Go Trekker Rain Flashlight Umbrella priced at $17.99, but enter promo code TOTES4 at checkout and that price drops to $13.99 with FREE shipping. DESCRIPTION: Brighten your path with the Totes TRX Titan Manual light n' go trekker umbrella. It comes with a built-in flashlight right in the handle, so you'll clearly see your steps. Featuring 3M's Scotch gard water resistance fabric canopy, the Totes TRX Titan provides the ultimate protection from the elements that won't cramp your bag or your style. 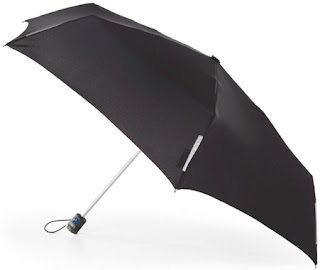 The ideal umbrella to use rain or shine is sun guard UPF 50 plus sun protection, which covers you from harmful UV rays. Weighing a mere 7.5 ounces and features a compact folding design, it is perfect to stash in your bag or glove compartment. Carabineer case attaches to jackets and totes in a snap for easy carrying. The reflective tape on umbrella borders for safety.